We’d love your help. Let us know what’s wrong with this preview of Skin Divers by Anne Michaels. Minarets of burdock clang in the copper marsh, the grapes' frozen skins flood with sweetness. To ask other readers questions about Skin Divers, please sign up. Anne Michaels’ poems confirm what her novels imply – that she is a diehard romantic. For her everything comes down to love. All her best lines are about love. Her characters find identity in love. I’m no authority on poetry so I’ll just say I enjoyed most of these poems a lot. Anne Michaels' Skin Divers is an absolutely phenomenal poetry collection, particularly so after I was a little disappointed by her novel Fugitive Pieces. Most of the stanzas here are achingly beautiful, and her writing is so intelligent and thought-provoking. Michaels' creation of imagery too is delightful and original: 'Starlight / soaks our shoes', and 'Frozen sparklers of Queen Anne's lace', for instance. I shall leave you with a few of my absolute favourite fragments from the collection. 'Ton Anne Michaels' Skin Divers is an absolutely phenomenal poetry collection, particularly so after I was a little disappointed by her novel Fugitive Pieces. Most of the stanzas here are achingly beautiful, and her writing is so intelligent and thought-provoking. Michaels' creation of imagery too is delightful and original: 'Starlight / soaks our shoes', and 'Frozen sparklers of Queen Anne's lace', for instance. I shall leave you with a few of my absolute favourite fragments from the collection. pacing under the loud insomnia of stars. pulling between us, bending time. Did I wake you . . .
like a page of love, wind-lost from a hand, unread. and still the way is new; strange stars. to the wind, fraying into sound. white lace, on sea-heavy legs. hungry for bread and oranges. flowers like bowls to save the rain. landlocked, they have given up on our return. at the edge of the world. like a mechanic's tool box. build me with her body. and loved you into stone. To use scar tissue to advantage. one's face to the world. we opened the landscape with our bare feet. So much learned by observation. on the blue climb over the falls. Belonging only to each other. between one hemisphere and another. it's right that our grief be unseen. This is a lovely book with plenty of gorgeous imagery, and Michaels did a lot of research first, which I always love. However, I felt that despite the concrete images, she used too many abstractions in the poems, and the significance often got buried, as did things like to whom the "you" referred to. It also took me out of the poems that she would situate them in such imagistic scenarios and then go into a stanza or more that told rather than showed. The last book of published poems by Michaels that I have yet not read. It's a bit bittersweet, I don't want it to end and so i read about one poem from it a month. birth-green of the spring firs. of desire darkening skin with light. a solar forest at the surface. hum of the desert heard by birds. This is a sweet and sentimental book with some really beautiful imagery. However, the style is not something that I enjoy. 4.5/5 stars. Really quite something!! There are a few immaculate books whose language is so rich that I can only read a few pages at a time before putting them aside to absorb them. They are not inaccessible books, usually the words themselves are very simple, but it's the combination of those words and the unexpected imagery and fresh perspective that blow my writing mind. This is one of those books. I've wanted to read Michaels' poetry for so long and I loved seeing echoes and starts of Fugitive Pieces and The Winter Vault here. Bu There are a few immaculate books whose language is so rich that I can only read a few pages at a time before putting them aside to absorb them. They are not inaccessible books, usually the words themselves are very simple, but it's the combination of those words and the unexpected imagery and fresh perspective that blow my writing mind. This is one of those books. I've wanted to read Michaels' poetry for so long and I loved seeing echoes and starts of Fugitive Pieces and The Winter Vault here. But the fact that those links were not direct ones fascinated me even more. Instead Michaels explores other shores of the same islands. I am still boggled by the fact that you can sense from the words on the page when the writing is true and personal and there's a divide between the three poems in Part II where Michaels delves even deeper into that personal realm to where I felt like I was touching a part of her soul. Skin Divers is Anne Michaels's third volume of poetry. I read it all in one sitting. It's a slim volume, as they say—only 68 pages including the acknowledgments—so this was not a great feat. But... I always feel a little guilty reading a book so fast when I know how long it probably took to write it. I'll try to make up for speed with re-readings. The most important thing for me about poetry is that it sound right. It should have rhythm. It should flow. Michaels's poetry sounds right. 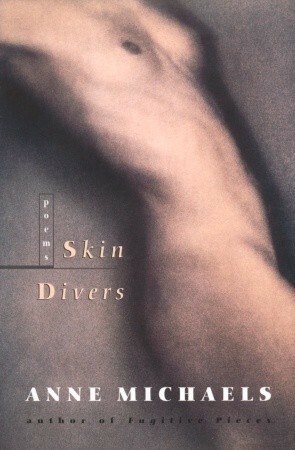 It's... de Skin Divers is Anne Michaels's third volume of poetry. I read it all in one sitting. It's a slim volume, as they say—only 68 pages including the acknowledgments—so this was not a great feat. But... I always feel a little guilty reading a book so fast when I know how long it probably took to write it. I'll try to make up for speed with re-readings. no one hears what’s in my head. don’t know what to do with themselves. in our forest, pale birches of our legs. everyone knows promises come from fear. The greatest poetry is poetry that literally slows you down. The richness of these words requires it. Each stanza like carefully gathered stones, each unique and full of hidden detail. But why try and describe poetry with poetry? All I can say is for some of us Anne Michaels is why we read poetry. I met her a few years ago and was doubly enriched by hearing her read. A great artist. An exquisite and meditative collection of poetry from a writer who never wastes her words. Some of the most beautiful poetry I've read. Her words flow off the page and paint beautiful images. The skin is the only way to get to know each other. To dive and swim and keep breathing, paradoxically, when it seems we can't breath anymore. Subtly crafted, stunning volume of poetry. Her poems are an intricate mélange of science, substance, and a note of poetry to set it off, a little like magic. One of the loveliest books I've read. Anne Michaels was born in Toronto, Canada, in 1958. She is the author of one novel Fugitive Pieces, which explores the possibility of love and faith alter the Holocaust, with language marked by power, elegance, and integrity. Ms. Michaels, who has also composed musical scores for the theater, has said "when you put a tremendous amount of love into your work, as in any relationship, you can't know--you can only hope—that what you're offering will in some way be received. You shape your love to artistic demands, to the rigors of your genre. But still, it's a labor of love, and it's the nature of love that you must give it freely." Anne Michaels's two collections of poetry are The Weight of Oranges (1986), which won the Commonwealth Prize for the Americas, and Miner's Pond (199 l), winner of the Canadian Authors Association Award and shortlisted for the Governor General's Award and the Trillium Award. Both collections have recently been released in one paperback volume entitled The Weight of Organges/Miner's Pond, published by McClelland & Stewart. With her first novel, Fugitive Pieces, Anne Michaels was shortlisted for the Giller Prize and the Canadian Booksellers Association Author of the Year Award, and won the Trillium Prize, the Chapters/Books in Canada First Novel Award, The Beatrice and Martin Fischer Award (the main prize in the Jewish Book Awards), and England's prestigious Orange Prize. Rights to the novel were sold to over 19 countries. And her novel, Fugitive Pieces, was made into a motion picture in 2007. Anne Michaels lives in Toronto. In 2007, she published a book of poems, Skin Divers. Her latest novel is The Winter Vault, published by McClelland & Stewart in 2009.